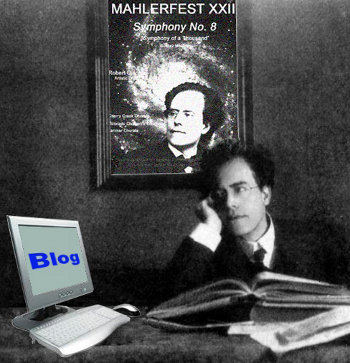 The Colorado MahlerFest is performing Mahler’s Fourth Symphony this weekend, May 17th and May 19th. In light of that concert, we felt you would find the following of interest. Most fans of Mahler’s music know that his first four symphonies are referred to as his Wunderhorn Symphonies, since the symphonies contain musical material from Mahler’s own song cycle Des Knaben Wunderhorn (The Boy’s Magic Horn). The brilliant British musicologist, Deryck Cooke, discusses this relationship, and goes on to explain the relationship between Mahler’s Third and Fourth symphonies, and the symphonic development of some of the key melodies. This discussion is fascinating in particular, since Mahler took an unused movement from the Third Symphony and made it the finale of his Fourth – and then composed the Fourth backwards! This entry was posted in Mahler's 4th, MahlerFest, Ron Nadel and tagged Colorado MahlerFest, Deryck Cooke, Des Knaben Wunderhorn, Gustav Mahler, Symphony. Bookmark the permalink.